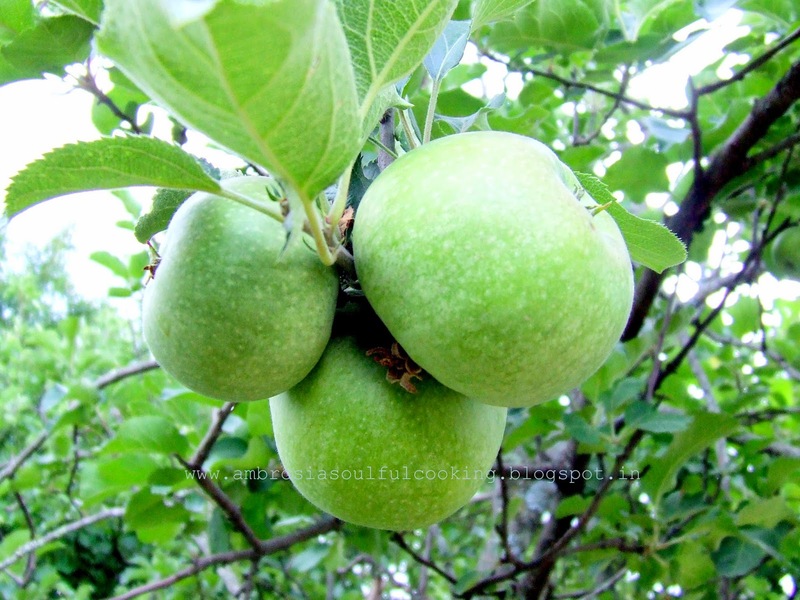 Ramgarh belt of Kumaon is famous for apples specially the Golden Green Apples. This variety is crunchy, sweet, juicy and flavourful. Last time when we went to the hills, we saw the apples growing in the trees. They were not ripe that time. These days, the fruit mart is full of apples – both local and from Himanchal. We bought some Golden Green apples. I baked a cake using the apples. I made some changes in the recipe. I used whole wheat flour in place of all-purpose flour. I used ¾ cup mineral sugar instead of I cup white sugar. I used table spread instead of butter. Please feel free to use the ingredients mentioned in the original recipe for a lighter buttery crumb. Whisk together flour, baking soda, cinnamon and salt. Beat butter and sugar till light and fluffy. Add eggs one at a time, beating well after each addition. Add vanilla essence and shredded apples. Add flour mix. Stir till well combined. Fold in walnuts. Spoon the batter into the prepared pan. Bake for 40 - 45 minutes or until a toothpick inserted in the center comes out clean. Remove from the oven after 10 minutes. Remove from the pan after 5 minutes. Cool in the rack. Serve with ice cream or with a dollop of cream or enjoy plain. 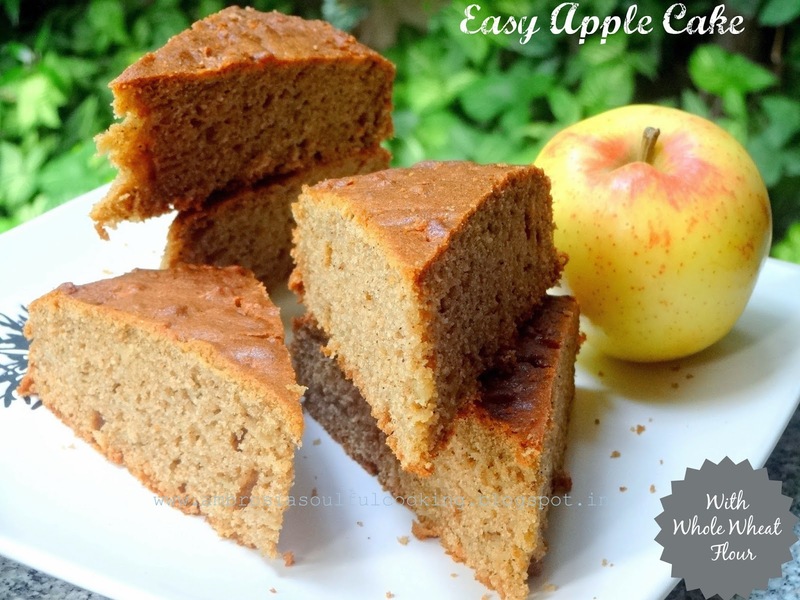 Apple cake is a favourite of mine, and so easy to adapt without eggs too! You have inspired me to get baking! 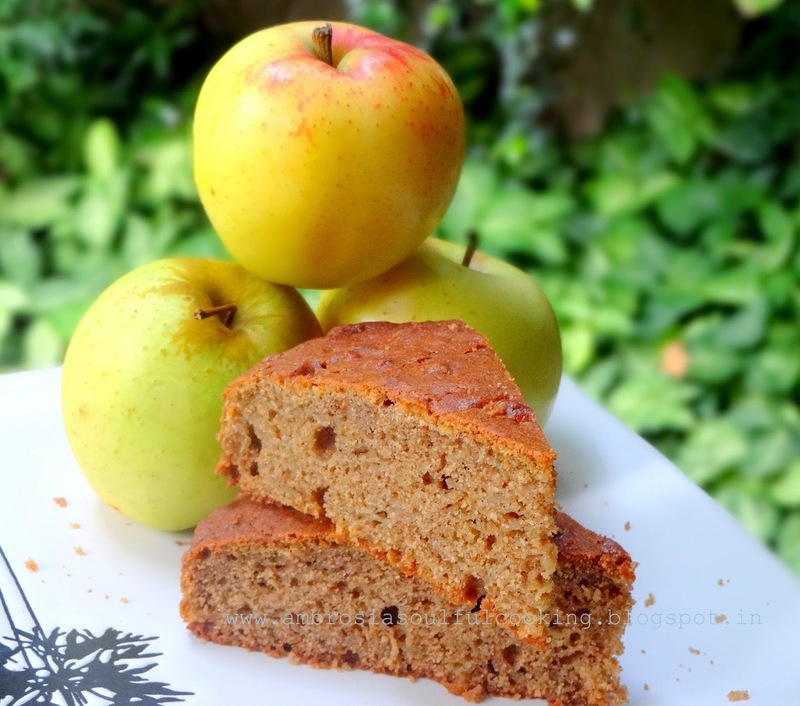 I love apples in bakes, this looks delicious! Hey! One small query.. The ingredients say baking soda but the method says baking powder.. Which one to use? Hi Priyanshi, it was a blunder on my part. The recipe has baking soda. I have corrected the same. Thanks for bringing it to my notice. Hope you bake it soon and enjoy it. LOL!